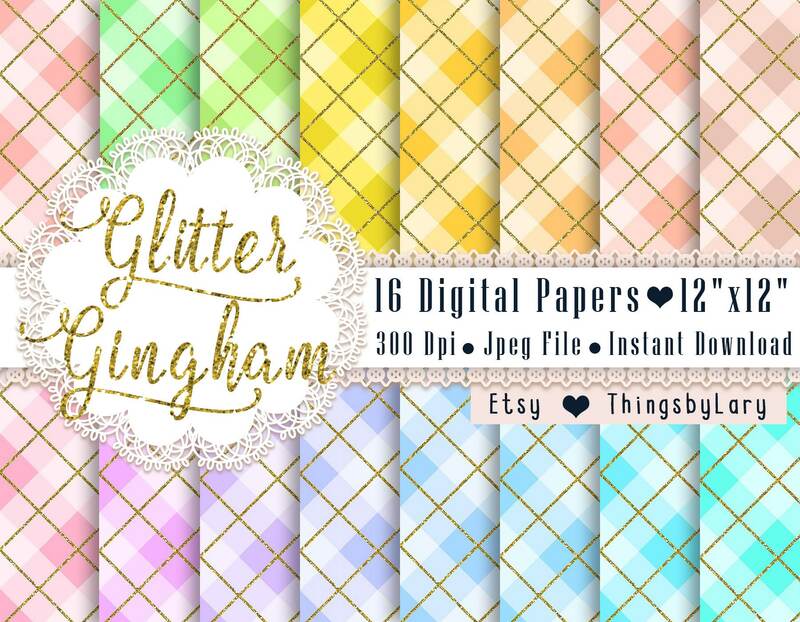 🍭 16 Gold Glitter Gingham Pattern Papers 12x12 Inch, Jpeg File, Instant Download, High Resolution 300 Dpi, Commercial Use, Seamless Pattern. ️🖍 Please note that: This listing is a Instant download digital file and no physical items will be shipped. 🎗️ 16 Gold Glitter Gingham Pattern Papers in 12" x 12" in Jpeg File. 📷 All made in high resolution (300 dpi). This pack is created with seamless patterns. So you can tile them to get whatever size you like. 🔖 You can easily use for cards, scrapbooking, wedding invitations, photo albums, gift wrapping, cupcake, table cloth, bag, mug and more. This listing is for digital downloadable files. Once payment is cleared, you will receive a notification email from ETSY to download your files. No physical products will be shipped. 🎗️ Please do not sell our products as is or altered and claim as your own. 🎗️ Please do not share or distribute our original files.